One of the most beautiful characteristics of mathematics is you can create multiple representations of a single concept. Functions for example can represented in words, equations, graphs, or tables. In this post, we represent geometrically an algebraic concept namely the sum and difference of two squares. The difference of two squares states you can factor into . You may use a piece of paper to follow the procedure below. 2. Cut out a small square with side length from one of the corners of the large square. 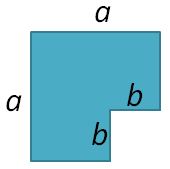 The area of the remaining figure is . Can you see why? 3. Fold and cut the remaining figure so that when the two pieces are put together, they form a rectangle. 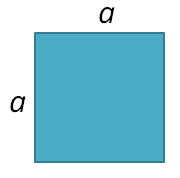 The rectangle has length and width . The geometric representation of algebraic proofs such as the third figure is called proof without words.